It is a long time since I felt excitement watching a Tyrone team playing football. I was at the Emyvale club in Monaghan a few days before last Sunday's semi-final. The club sponsor from Silverhill Ducks presented me with a duck down duvet and pillow set. He said: "You can use these to sleep in the studio during Tyrone matches." Which got a big laugh. The RTÉ box on Sunday was packed. Michael Murphy, Colm Cooper, Ciaran Whelan, Tomás Ó Sé, Lee Keegan and a host of others, all expecting the usual zonal defence v zonal defence rigmarole. After two minutes, I elbowed Murphy: "Bloody hell, Tyrone are going man-to-man." Which signifies the most important strategic decision of Mickey Harte's career. Watching the overhead cam footage, it is apparent that Tyrone have adopted Dublin's defensive template. That is, each player marks his man when they lose possession, save for Colm Cavanagh (substitute Cian O'Sullivan), who drops back into the pocket in front of the full-forward. The other players get goal side of their men and drop back a few metres off them, forcing them to pause. It worked very well for them. In May, when they played Monaghan at home in the first round, their zonal defence shipped 1-18. Karl O'Connell made hay on the right flank, thundering upfield unmarked. Vinnie Corey did the same on the left, scoring the goal and generally causing mayhem. Conor McManus moved cleverly around the zone, exploiting its gaps and kicking three scores from play on his way to a man-of-the-match performance. I have been saying for several years that Tyrone have nothing to fear and everything to gain from switching to the man-to-man format with Cavanagh sweeping. When Dublin picked their zone to pieces last August, it was not a one-off. The only reasonable conclusion was that if Tyrone (or any other contender) wanted to win big, they would have to switch from factory football to real football. Malachy O'Rourke simply copied Dublin's method for overcoming the zone, and Tyrone were convincingly beaten at home by a group that had less quality. In the last quarter they were sitting ducks, with a fluky late goal only serving to take the bad look off the scoreboard. They suffered the same fate against Dublin at home a month ago, the Dubs efficiently picking them off. In Ballybofey a fortnight ago, Donegal waltzed through the zone again, building up a four-point lead by the 38th minute, forcing Tyrone to push up. When they did so, they looked good. Why wouldn't they? They have a load of good players after all. All the while, Mickey and his backroom team were watching Galway, where his old assistant Paddy Tally had created a virtually identical zonal defence. Again, it must have been increasingly clear to them that this system does not work. Dublin (with a man down for almost a half) easily beat them in the League final. Monaghan, using the Dublin template, poured through Galway's zone scoring 0-16 and holding them to a miserable 0-8. Galway's defenders couldn't tackle Corey, or McAnespie, or Wylie, or Walshe because they were taking up a position in their zone, unable to react to the game as it unfolded. Mickey would have seen all of this. He is not a fool, and therefore was driven to the conclusion that if Tyrone persisted with this system they would get the same results as they did before. In the run-up to the Monaghan game, he would have had a number of specific concerns: How can we curb Vinnie Corey, O'Connell, McAnespie, Wylie, Walshe if they are unmarked when they probe the zone? How can we curb McManus if he does what he did at Healy Park in May, i.e. station himself in the middle third, then break forward late? The zonal defensive system breeds caution, with defenders quickly becoming used to being helped by teammates and feeling isolated if they are not. Likewise, management teams fear the consequences of switching to man-marking because they are so used to rehearsing this method of play, and they worry about the impact on the team of abandoning it. All of this would have been in Harte's mind. But in the end, it was a no-brainer. Even if they were to beat Monaghan playing the zone (and I doubt very much if they would have, given Monaghan's buoyancy coming into the game and the ease with which they had so recently overcome Tyrone and Galway), Dublin would have convincingly beaten them in the final, after a facile dress rehearsal against Galway which was a carbon copy of their own annihilation by the Dubs last August. So, the only thing for it was to trust the players and switch to man-v-man. The immediate impact was to unsettle Monaghan, whose carefully rehearsed attack plan was instantly redundant. Tyrone dispossessed them high up the pitch. Monaghan had no time on the ball. Corey and O'Connell were neutralised. Conor McManus hardly touched leather. None of their key players made any attacking impact. Defensively, it worked brilliantly for Tyrone. Offensively, it was not a success. But this was to be expected. The excitement and unpredictability generated by Tyrone going man-to-man meant a lot of spontaneity. Blanket defensive teams are used to very routined, repetitive attacking, as they are forced to carry the ball forward from the massed defence, don't play with a half-forward presence and have to be patient and slow in their build-up. But with man-to-man football, players must be imaginative and alert to the possibilities of the game, and the team must attack with cohesion. This in turn requires them to play a lot of football together, so they can build up that attacking chemistry and understanding of each other that is the essence of a great team. Tyrone simply haven't had time to do this. Up until now, the one or two forwards who have not been required to drop back into the zone have been left isolated and double-marked, getting the ball in non-dangerous areas and generally just laying it off again. Now, however, they have been given their freedom, but having been institutionalised for so long, they are uncertain how to proceed. In the first half, they threatened to destroy Monaghan, who were utterly shell-shocked. But instead of being able to take advantage of the attacking options appearing all around them, they took bad shots, passed when they should have shot, didn't make the right runs and generally squandered all that space, time and opportunity. Between the 13th and 22nd minute, they kicked seven terrible shots, four wide and three into the keeper's hands. By half-time, they had kicked seven wides and five into the keeper's hands, and somehow Monaghan were level. It is hard to trust yourself when you are not used to being trusted. Had Dublin had those opportunities it would have been a turkey shoot, whatever that is. The previous day, Dublin scored seven points from their first seven attacks. By half-time, they had taken 12 shots, scoring 1-9. In the second half, they took a further 19 shots, scoring 15 points. Their attack efficiency of over 80 per cent is unprecedented, and it comes from years of playing intuitive football where each player is trusted and over time is able to react quickly and imaginatively to what is happening on the field. Think Jack McCaffrey's handpass over the top to create Dublin's goal last Saturday. Or Con O'Callaghan's goals last season. Or anything Paul Mannion does. Or anything Howard does. Or McCarthy. Or Kilkenny. Or Fenton. They are alert to all the possibilities of the game because they have been playing this way for years. Look at it this way: Why is it that only Mayo have been able to put it up to the Dubs? For years now, replays, one-point injury-time defeats, extraordinary losses (remember the two own goals?). It is because they go man-to-man against them. Because the Dubs do the same, Mayo are able to play attacking football, get goals, and generally create humungus excitement. This method also allows Mayo to stifle Dublin's attacking threat. Instead of shuffling around inside a zone, being picked off at will, they are in the Dubs' faces, turning them over, creating chances and playing Gaelic football. "It's the only way," said Lee Keegan in the RTÉ box when Tyrone went man-to-man last Sunday. "They'll be a serious team if they trust themselves." Tyrone won last week because their man-to-man defending ruined Monaghan's rigid attack plan. The attacking chemistry will take a bit longer. This All-Ireland final may have come too soon for them. 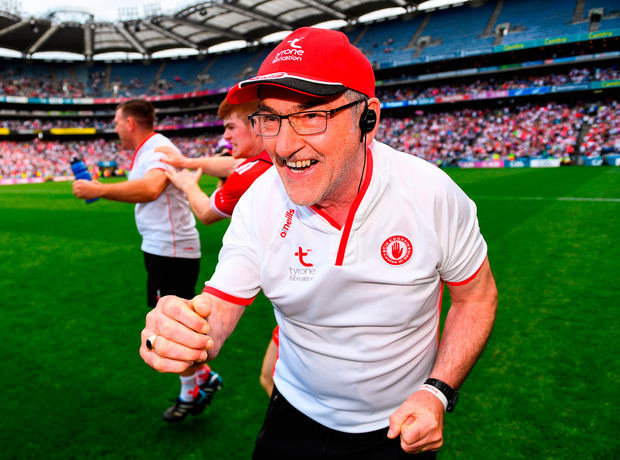 But the bottom line is that Tyrone have nothing to fear and everything to gain from reverting to Gaelic football in all its glory and unpredictability and excitement. No more sleeping through Tyrone matches.